Lillian Gish in the 1920 film ‘Way Down East’ working in freezing conditions! In 1920 D W Griffith made what some people class as the greatest movie of all time, ‘Way Down East’ (1920) starring Lillian Gish. Mr Griffith wanted realism at any cost, he wanted nothing to do with the white painted cornflakes that were regularly used as studio snow at that time. 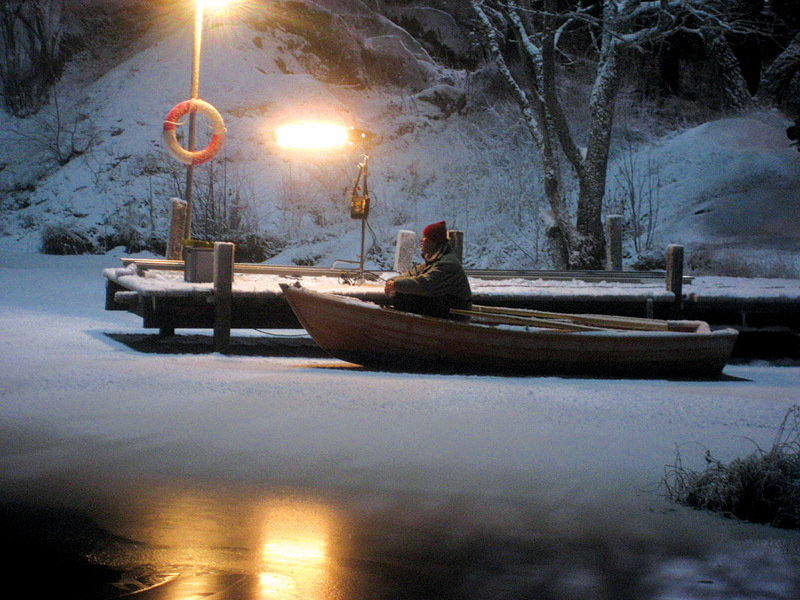 For the climax of the movie, Anna (Lillian’s character) was to be driven out into the blizzard and stumble on to the rivers of moving ice. Lillian Gish wrote …”‘Our house was near the studio and I was to report to work at any hour that snow started to fall, as we had both day and night scenes to film. It was a late but severe winter; even Long Island Sound was frozen over. I slept with one eye open, waiting for the blizzard. Winter dragged on and was almost over and still those important scenes hadn’t been filmed. The blizzard finally struck in March. Drifts eight feet high swallowed the studio. Mr Griffith, Billy, the staff and assistant directors stood with their backs to the gale, bundled up in coats, mufflers, hats and gloves. To hold the camera upright, three men lay on the ground, gripping the tripod legs. A small fire burned directly beneath the camera to keep the oil from freezing. Again and again, I struggled through the storm. Once I fainted – and it wasn’t in the script. I was hauled to the studio on a sled, thawed out with hot tea and then brought back to the blizzard, where the others were waiting. We filmed all day and all night, stopping only to eat, standing near a bonfire. We never went inside, even for a short warm-up. The torture of returning to the cold wasn’t worth the temporary warmth. The blizzard never slackened. At one point, the camera froze. There was an excruciating delay as the men, huddled against the wind, trying to get another fire started. At one time my face was caked with a crust of ice and snow and icicles like little spikes formed on my eyelashes, making it difficult to keep my eyes open. Even today, when filming on real snow locations, the logistics of getting equipment, cast and crew safely on and off the snowbound sets adds a whole new dimension to the challenges faced by any production. These challenges are even greater when filming on mountains, frozen lakes or within the Arctic Circle. When a film crew work on an area of real snow, it soon turns to mud and any area requiring ‘virgin snow’ can only be used for one take, costumes get wet, cast, crew and equipment freezes, trucks get stuck. No movie in this age has the budget to wait for real snow to arrive when falling snow or blizzards are required. Artificial snows solved these problems but at the same time created a whole bunch of new ones. Snow Business has dedicated itself to developing and producing new materials and methods of application over the last 25 years. Unbelievably, white asbestos became popular for a time in the 1930’s and 1940’s. It can be seen in films like ‘The Wizard of Oz’ (1939). At that time white asbestos could also be bought over the counter (packaged as an artificial snow) for the family use on the Christmas tree! ‘It’s a Wonderful Life’ (1946) used white sand and gypsum to create the snow dressing. Wet foam was used for the falling snow and this can be seen streaking over George Bailey’s (played by James Stewart) costume during the car crash scene. Modern dry foams do not do this, they are much more realistic. They have controllable size and rate of fall, the snowflakes look like snowflakes and are self-clearing. Our dry foam systems are now in use around the world at huge public venues and we used them to obtain the Guinness world record for the largest area ever covered with artificial falling snow (over a mile of Bond Street in London). For the cavalry charge across the frozen river in ‘Dr Zhivago’ (1965) white marble dust was laid over steel sheets. Marble dust is heavy, expensive and very difficult to remove, any remnants that remain form a semi-permanent white patch in the landscape. Today, modern cellulose dusts can be used – they are more versatile, faster to lay and have the key advantage of leaving the location clean. They have even been authorised for use on SSSI and other sensitive sites. The ‘ice palace’ scenes from ‘Dr Zhivago’ were created using paraffin wax dressed over white wadding. Paraffin wax has been used since the beginning of film to simulate ice and icicles but it was only with the making of ‘Day After Tomorrow’ (2004), that bespoke equipment was designed to dress the huge areas quickly and safely. 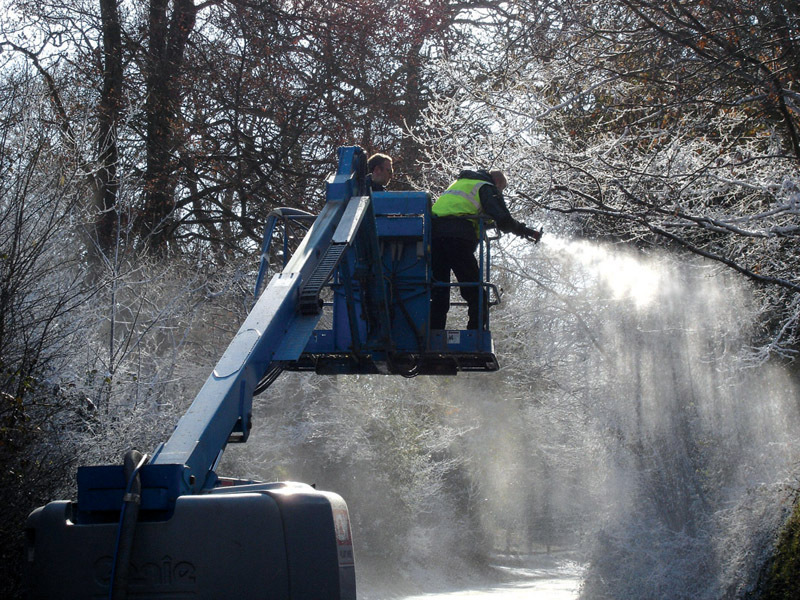 Modern Ice Waxes have now been developed for spraying which do not yellow under sunlight (for longevity) and are much harder (allowing for use in hot climates). Urea formaldehyde foam, a two-part foam mix that sets into place, was very popular from the late 60’s to the early 80’s. It can be seen in ‘Dr Doolittle’ (1969) where it was used to dress the streets and rooftops of Castle Coombe in Gloucestershire. Urea formaldehyde foam can look fantastic, particularly for large blocks of snow but it is a devil to remove, particularly from surfaces like Cotswold stone. Modern SnowWhite replaces it, this foam is free of Beetlejuice and CFC’s. It can be removed easily by jet washing and when disposed of, it biodegrades. Dendretic salt was very popular in the 1980’s but as with all salts (and sand) it moves in a different way to real snow and more importantly is poisonous, corrosive and capable of doing severe and expensive damage to any location. Magnesium Sulphate was considered at that time as the best snow available (until SnowCel was invented), although it was very expensive it had the advantages of a lovely sparkle and being non-corrosive. As with all salts it is heavy and, when laid outside, will completely disappear with one nights’ rain. It cannot be dressed onto roofs or foliage and it has the disadvantage, when used in quantity, of killing plant life. When it is washed into porous stonework, it leaches out over decades leaving an ugly white tidemark. All unacceptable to the property owner! Today, there are many types of paper-based products on the market that can be used as snow but caution has to be exercised as many of them contain salts, fungicides, pesticides and even Borax. The SnowCel range is the only product specifically designed for use on movie sets (fireproof) and locations (chemical free). Modern paper based snows are light and can be laid at amazing speed. The delivery systems blow the snow into the air so that it settles just like real snow, the material passes through a high-pressure water mist so that when it makes contact it ‘bonds’ to the surface (sticking inches deep even to inverted surfaces). The paper does not kill or damage plants and cannot be absorbed into porous stonework thus avoiding any later staining. It is crucial to ensure that before any snow is laid, the location is correctly prepared. Huge rolls of SnowMembrane (600 sq m) are used to cover lawn and garden areas before any loose snow dressing is applied. The membrane allows water and sunlight to pass through whilst still being strong enough to gallop a horse across. On wrap, snow is washed off the trees and shrubs on to the membrane, the membrane is then rolled up to leave a spotless location underneath. Falling snow technology has moved forward tremendously in recent years. Modern ground based machinery can deliver vast amounts of snow into the air almost silently to fill acres with realistic, slow-falling, self-clearing snow. Gone are the days of plastic flake or the Polystyrene beads that seem to last forever haunting old movie locations for many years whenever the wind changes. On any modern movie snow set you can expect to see a combination of seven or eight types of snow in use at any one time. SnowMembrane to protect the location. SnowCel Full Size paper to give depth, SnowCel Half Size paper to give refinement. SnowSparkle top dressing to add that ‘twinkle’. Polymer top dressing for improved tracks and pick up on costume, PowderFrost or SnowEx to fill in background, BioFlake for use as falling snow and IceWax white to simulate that frozen mountain ‘crust’ to break realistically under footfall. Gone are the days of dressing snow by hand using scoops, shovels or stirrup pumps. Machines create a natural dressing at a non-stop rate of up to 2 sq m per second. Modern artificial ice is sprayed by all electric, computer-controlled technology at a rate of up to 1 sq m per minute. Gone are the days of toxic materials and damaged locations. By selecting the right material and processes and by doing the correct preparation, any location can be dressed realistically and can be left undamaged. Work is completed regularly on the most sensitive of sites, including SSSI, English Heritage and National Trust properties. Modern materials are recycled, eco friendly, biodegradable and incorporate low embodied energy. The paper used is chlorine free, the cellulose is from managed, renewable sources. Work has already started on auditing each type of snow in order to issue a full eco-rating covering its manufacture, use and disposal. That way we enable productions to make even better and more informed choices for filming. CGI has created the opportunity for filmmakers to make even more ambitious snow and winter effects movies. Films such as ‘Day After Tomorrow’, ‘Alien vs. Predator’ and ‘Star Trek’ allow practical snow making skills to be developed even further, ensuring the continuation of the industry into the future and benefitting all productions through the availability of better equipment and materials.